Edward Kmett’s lens library made lenses talk of the town. This is, however, not a lens tutorial (let’s wait for the upcoming Simon Peyton Jones’s intro to lenses (edit: here it is)). I’m going to concentrate on one aspect of lenses that I’ve found intriguing — the van Laarhoven representation. Quick introduction: A lens is a data structure with a getter and a setter. Given object of type b, the getter returns the value of type a of the substructure on which the lens is focused (say, a field of a record, or an element of a list). The setter takes the object and a new value and returns a modified object, with the focus substructure replaced by the new value. The two elements of Store are just like getter and setter except that the initial b -> was factored out. The only way the van Laarhoven function could produce the result g b is if it has access to a function a -> b and a value of type a (which is exactly the content of Store). It can apply the function a -> g a to this value and fmap the function a -> b over it. Russell O’Connor showed the isomorphism between the two representations of the Store comonad. Here, (a -> t) is a function, which is mapped to g t — some functor g acting on type t. This mapping is defined once for all possible types t — it’s a natural transformation — hence forall t. All such natural transformations are equivalent to (parameterized by, isomomophic to) a type (set of values) g a. I use the symbol ≈ for type isomorphism. There definitely is a pattern, but we have to look at the application of Yoneda not to Haskell types (the Hask category) but to Haskell functors. We are in luck because functors form a category. 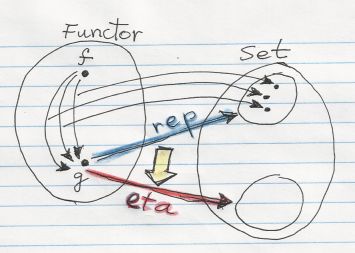 Objects in the Functor Category are functors between some underlying categories, and morphisms are natural transformations between those functors. Here’s the Yoneda construction in the Functor Category. Let’s fix one functor f and consider all natural transformations of f to an arbitrary functor g. These transformations form a set, which is an object in the Set Category. For each choice of g we get a different set. Let’s call this mapping from functors to sets a representation, rep. This mapping, the canonical Yoneda embedding, is actually a functor. I’ll call this a second order functor, since it takes a functor as its argument. Being a functor, its action on morphisms in the Functor Category is also well-defined — morphisms being natural transformations in this case. Now let’s consider an arbitrary mapping from functors to sets, let’s call it eta and let’s assume that it’s also a 2nd order functor. We have now two such functors, rep and eta. The Yoneda lemma considers mappings between these 2nd order functors, but not just any mappings — natural transformations. Since those transformations map 2nd order functors, I’ll also call them 2nd order natural transformations (thick yellow arrow in the picture). What does it mean for a transformation to be natural? Technically, it means that a certain diagram commutes (see my Yoneda tutorial), but the Haskell intuition is the following: A natural transformation must be polymorphic in its argument. It treats this argument generically, without considering its peculiarities. In our case the 2nd order natural transformation will be polymorphic in its functor argument g.
The Yoneda lemma tells us that all such 2nd order natural transformations from rep to eta are in one-to-one correspondence with the elements of eta acting on f. I didn’t want to overcrowd the picture, but imagine another red arrow going from f to some set. That’s the set that parameterizes these natural transformations. Let’s get down to earth. We’ll specialize the general Functor Category to the category of endofunctors in Hask and replace the Set Category with Hask (a category of Haskell types, which are treated as sets of values). Elements of the Functor Category will be represented in Haskell through the Functor class. If f and g are two functors, a natural transformation between them can be defined pointwise (e.g., acting on actual types) as a polymorphic function. The second ingredient we need is the mapping Eta that, just like Rep maps functors to types. Since the kind of the functor g is * -> *, the kind of Eta is (* -> *) -> *. There are many mappings that we can substitute for Eta, but I’d like to concentrate on the simplest nontrivial one, parameterized by some type b. The action of this EtaB on a functor g is defined by the application of g to b. The final step is to apply the Yoneda lemma which, in this case, tells us that the above type is equivalent to the type obtained by acting with EtaB b on f. This type is simply f b. Do you see how close we are to the van Laarhoven equivalence? We just need to find the right f. But before we do that, one little exercise to get some familiarity with the Yoneda lemma for functors. On the one hand we have a function g a -> g b which maps types lifted by the functor g. If this function is polymorphic in the functor g than it is equivalent to a function a -> b. This equivalence shows that fmap can go both ways. In fact it’s easy to show the isomorphism of the two types directly. Of course, given a function a -> b and any functor g, we can construct a function g a -> g b by applying fmap. Conversely, if we have a function g a -> g b that works for any functor g then we can use it with the trivial identity functor Identity and recover a -> b. So this is not a big deal, but the surprise for me was that it followed from the Yoneda lemma. So the right hand side of the Yoneda lemma is equivalent to the Store comonad (a, a -> b). Which is exactly the van Laarhoven equivalence. This formula is parameterized by two entities: a functor f and a 2nd order functor Eta. In this article I restricted myself to one particular 2nd order functor, EtaB b, but it would be interesting to see if more complex Etas lead to more interesting results. In the choice of the functor f I also restricted myself to just a few simple examples. It would be interesting to try, for instance, functors that generate recursive data structures and try to reproduce some of the biplate and multiplate results of Russell O’Connor’s. It says that a polymorphic function that takes a function a -> c and returns a c must have some fixed a inside. This is pretty obvious, but it’s nice to know that it can be derived from the Yoneda lemma. Special thanks go to the folks on the Lens IRC channel for correcting my Haskell errors and for helpful advice. After I finished writing this blog, I contacted Russel O’Connor asking him for comments. It turned out that he and Mauro Jaskelioff had been working on a paper in which they independently came up with almost exactly the same derivation of the van Laarhoven representation for the lens starting from the Yoneda lemma. They later published the paper, A Representation Theorem for Second-Order Functionals, including the link to this blog. It contains a much more rigorous proof of the equivalence. From computational point of view, it’s not true. There is no way to write a function with “forall c . (a -> c) -> c -> a” signature without using “undefined” or “unsafePerformIO”. That’s because such type is CH-isomorphic to proposition NOT(NOT(A)) => A, which doesn’t hold in intuitionistic logic. The fact that Yoneda lemma, CPS and double-negation are just three faces of one thing always amazed me. Great observation! Frankly I wasn’t aware of this. Of course the isomorphism still holds in category theory, which is all that matters. The main reason I switched to Haskell notation was that I’m not fluent in mathematical notation and the blog was intended for Haskell programmers. @Russell : That’s a good point. I’ve found a much better explanation here. The latter is trivial to define as Russell O’Connor has shown. The former is not (without cheating). All of this (as is often the case in category theory) is a special case of the Yoneda lemma’s statement with Kan extensions. could you reupload it again? thank you!